Are alternative energy sources the answer to ending human dependence on oil? This project investigates the production of oil and the development and utilization of other energy resources. It concludes that there are already alternative energy sources that could be utilized to end human dependence on oil, but that the real key to ending dependence on oil is economic. Murray and King present an intriguing antecedent to this question when they suggested that "oil's tipping point has passed" and "The economic pain of a flattening supply will trump the environment as a reason to curb the use of fossil fuels" (p. 1 online). They argue that while there are many valid energy-related and ecological issues to consider when contemplating the history of human dependence on oil, the final choice to switch to alternative energies is likely to be made on the basis of economy. From 2005 on, the demand for conventional oil and crude production has exceeded the ability to supply it. Murray and King suggest that the ability to produce, relative to demand, has now reached the point that it would be considered inelastic, or unable to respond to demand. The radical prices swings that have been seen in the past few years are symptomatic of this occurrence. Further, the fossil fuels cannot make up the difference. Bryce pointed out that the problem is really one of scale. If we consider energy in terms of an oil equivalent (i.e., how much energy do we use, if we reduce all measurements to terms of barrels of oil) then there are serious issues with supply and demand even now. Coal provides roughly a quarter of the total energy being used in the US today and about half of the electricity is coal produced. In actual terms, we consume 19 million barrels of oil per day, with daily natural gas production being the equivalent of another 11.9 million barrels of oil and coal representing 11.9 million barrels of oil per day. Nuclear power produces the equivalent use of 3.8 million barrels per day, and hydropower, wind, solar, geothermal sources, wood waste, and all other resources producing the use equivalent of 1.1 million barrels of oil energy per day each. The total use equivalent per day is roughly 47.4 million barrels of oil equivalent per day, of which solar and wind produce 76,000 barrels per day. The net effect of these numbers is that production is staying steady and has been for a number of years, while the price is going up. The net effect is that even if we leave moral and ecological questions aside, it is simply becoming too expensive to use oil as a primary resource. Equally troubling is the reality that oil production as a percentage of the total oil reserves is decreasing and production around the world is declining. In short, the supply is decreasing and the demand is increasing. This creates a situation which makes dependence on oil dangerous. From this standpoint, alternative energy resources are not the answer to ending human dependence on oil. Our dependence on oil resources is ending because the supply is going away. The question then becomes What can we do to fulfill our energy needs? Are the Alternatives Here to Stay? We saw in the previous section that coal, nuclear, hydropower, wind, solar, geothermal sources, wood waste, and all other resources combined make up only a fraction of the total energy demand. Engineers around the world are seriously looking at alternatives, finally having become convinced that oil is not a renewable resource. The United States is not leading the way in this investigation. An example is alternative fuels for cars. Cars that utilize alternative energy, such as hydrogen, are being tested in China, India, and in Brazil. The less technologically advanced nations seem to be finding it easier to switch from the use of knowledge (production) to innovation (development of knowledge). If we can determine how they are doing so, will it be possible for the United States and other nations to also make that paradigm shift? It is possible that it is simply easier to develop this type of technology in nations that are not so wedded to the use of oil. This would represent a huge difference between the US and these other nations from the ‘wheel' standpoint. I suggest that we must consider the development of new alternative technologies from the standpoint of the wheel. For generations we have been cautioned not to reinvent the wheel. We speak derisively to our children of making more work for themselves by reinventing the wheel. We may have unwittingly placed ourselves in a mindset where developing new energy technologies seem too much like reinventing the wheel. It would make sense, from a logical standpoint that less oil-dependent nations would be able to bypass that state of development; rather than reinventing the wheel to run on another form of power, they are simply inventing a different type of device or types of devices, which will be their wheel. Legal problems exist in the United States, Great Britain, and other highly developed nations that will not necessarily exist in China, India, Brazil, and South America. Both the US and Great Britain have highly evolved safety laws which govern the definition of vehicles that can run upon American or British roads. Some of the changes that need to be made to the basic design of motor vehicles in order to make the energy efficient may not make the vehicle legal to drive on American roads or highways. Gradually the US is looking at alternative energy streams, and the hybrid vehicles that are a mix of electric and gasoline are being allowed on the roads. Some energy installations have utilized vehicles that run on natural gas for years. Volkswagen has developed single seat electric car it has named the Nils. It is designed to have a top speed of 130 km/hour (or roughly 80 mph). The Nils, which was designed to reduce carbon emissions and improve energy efficiency, has a rear engine layout and has exposed wheels (Car and Driver, n.d.) The car, which weighs only 1014 pounds, does not have much power but the lightweight frame is intended to compensate. Audi has also released a similar car. However, while thee cars have been tested in China and India, there is no mention of bringing them to the US, where the entire culture is geared towards bigger vehicles. While hybrids are gradually appearing in the US, including some relatively small two seaters, it remains to be seen if these vehicles will qualify to be driven as cars or if they will be considered to be golf carts or go karts by the American legislature. This is part of the concept of reinventing the wheel that I mentioned earlier: it is, perhaps, easier to develop and then introduce these products into nations with less restrictive rules than it would be to have to reinvent the administrative and legal codes that regulate products in the US and Great Britain. Today, homes are increasingly being heated with solar power and geothermal energy. Across the mountain ridges in the US and extending from the east to the far west, windmills are appearing on the tops of ridges. Prices for this form of energy are cheaper than oil prices simply because the energy does not have to be imported, and prices are negotiated in advance when the wind farms are established. Further, unlike land used for oil wells, land surrounding windmills can still be used for farming and agricultural pursuits. The biggest side effect seems to be damage to the local bird and bat population. This side effect can be minimalized by conducting the proper studies prior to installing the farm. Even the Audubon Society, a notoriously ecologically conservative group, supports the use of windmills as long as wildlife protection is observed. A study by Erickson, Johnson, and Young has shown that the loss of birds to wind turbines is exponentially low when compared to other modes of loss. Bird-building collisions, for example, kill over 550 million birds a year, representing 58.2% of the total bird population loss. Wind turbines, on the other hand, kill roughly 28,500 birds a year, or less than .01 percent of the total avian mortality. This ranks significantly behind other hazards, such as cats and cell tower collisions. Biomass is becoming increasingly popular in some areas of the world and offers a significant advantage to coal and oil for heating purposes. Biomass is developed from plant based materials. Materials that might otherwise be wasted can be put to use, but biomass is considered renewable because plants can be grown and harvested specifically for biomass production. Five general categories of materials can be used in biomass production: new wood, energy crops, food waste, industrial wastes, and leftovers from the agricultural process (Biomass Energy Centre, 2011). In essence this means that much of the raw materials are someone's trash and can be acquired for little or no investment. In fact, many of these raw ingredients could be had in some areas for the cost of hauling them away. While energy crops are typically those crops grown specifically for the production of energy, even waste from harvests, typically left upon the ground or gathered up and discarded, can be utilized in the production of biofuels. In the figure above, a truck is taking the biogoods for processing. As earlier paragraphs showed, vehicles can be purchased that decrease the carbon footprint typical of transportation vehicles. The plant, which undoubtedly needs electricity to run, can be offset with wind farming. Plants purchased for biofuel can be offal or they can be deliberately produced by the company for use in fuel production. The entire cycle represents a significantly lower carbon footprint than a typical fuel oil-dependent production center and operation. Other significant advantages to the use of biomass include a quick production time and limited processing. Oil and fossil fuels take so long to develop that they are essentially non-renewable. Biomass raw ingredients can be produced from extremely quick growing crops, and production time is very short. Thus, biomass is renewable at an amazing rate of speed. 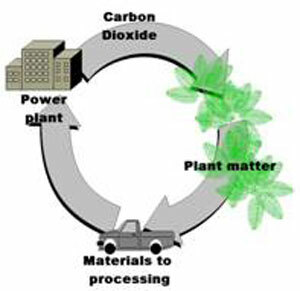 Biomass also reduces the amount of greenhouse gases released into the air. Biomass Production Cycle. The biomass production cycle itself is fairly short; the wet vegetable mass that will become biomass fuel is first spread outside on a paved area. Once it has dried for several days it is put in a silo for storage of up to 36 hours. Large facilities operate 24 hours a day so it is unlikely the biogoods will be stored for long. Once the materials are ground and produced into pellets they are put in silos to be cooled. Once cooled, they are moved to dispatch silos and deliveries are set. The final silos can store the pellets for up to a week. The most important criteria in the production process is the regulation of heat to avoid flash ignition of the materials. The areas must be aerated and temperatures monitored but again these actions can take place through ecologically sound and energy efficient processes. The pellets must be kept from getting wet while they are in transport and being delivered with the customer. The greatest weakness to this product is its susceptibility to water. Common Use of Biomass Pellets. Although biomass can be used in an open fire configuration, it is not very efficient when used in that manner. Instead, a biomass system can be installed that not only heats a single house but can heat multiple commercial buildings. In addition, because of the way biomass heating systems are organized, it is easy to block off heat to certain rooms if that is the customer's desire. Biomass can be used in some areas where open air burning is prohibited. In Ireland, for instance, biomass is approved provided the stove and the pellets are certified when purchased. In the United States, some areas allow the use of biomass and others do not; this is an area that needs to be addressed through legislation since biomass is both highly efficient and has low levels of pollution. Some biomass stoves can also use wood chips, wheat, sunflower seeds, grass and trimmings from the garden, and even fruit pits. This makes them even more desirable from a cost perspective. Biomass stoves can also be hooked into existing ducts in homes and can be used to heat water in lieu of a hot water heater. This paper began with the question Are alternative energy sources the answer to ending human dependence on oil? As this document has illustrated, alternative energy resources are available, and they are cost effective and efficient. However, dependence on oil continues, at least in the United States. This project has suggested that other nations may be taking greater steps to energy independence because they are inventing the wheel, not attempting to reinvent it. In order for newer, modern and more cost effective and ecologically efficient alternative energy supplies to be used in the United States, the legislative environment must be changed to allow these innovations. Thus, the solution to dependence on oil is not technology, which exists; it is economics. When it becomes more economical to depend on local sources, we will do it. The first step, in my opinion, is to eliminate tax benefits for investing in petroleum production and switch those benefits to those who produce and/or utilize wind power, biomass, solar energy, and other forms of energy. Clean coal production should be allowed, but carefully monitored. Fossil fuel utilization should gradually be taxed at higher and higher rates. Will this occur? I am not hopeful. I only know that it will work. Altenburg, T.; Schmitz, H., & Stamm, A. Breakthrough China's and India's transition from production to innovation. World Development 36 (2):325–334. Biomass Energy Centre. What is biomass? United Kingdom. Bryce, R. Let's get real about renewable energy. Wall Street Journal. Car and Driver (n.d.) Volkswagen NILS EV concept. Car and Driver Frankfurt Auto Show. Daulton, M. Testimony of Mike Daulton, Director of Conservation Policy, National Audubon Society. Committee on Natural Resources Subcommittee on Fisheries, Wildlife and Oceans Impacts of Wind Turbines on Birds and Bats. Erickson, W., Johnson, G., Young, D. A summary and comparison of bird mortality from anthropogenic causes with an emphasis on collisions. USDA Forest Service Gen. Tech. Rep. PSW-GTR-191. Kunz, T., Arnett, E., Cooper, B., Erickson, W., Larkin, R., Mabee, T., Morrison, M., Strickland, M., &amp; Szewczak, J. Assessing impacts of wind-energy development on nocturnally active birds and bats: A guidance document. J. Wildlife Manage. 71:2449-2486. Murray, J. & King, D. Climate policy: Oil's tipping point has passed. Obernberger, I., & Thek, G. The Pellet handbook: The production and thermal utilisation of pellets. London: Earthscan.